Budweiser Pro Late Model (50 laps) 1 61 TJ Brackett, Buckfield; 2 53 Alan Wilson, Hebron; 3 28 Mark Lundblad, Jr., Conway, NH: 4 36 Scott Robbins, Dixfield; 5 09 Jeremy Davis, Tamworth, NH; 6 94 Shawn Martin, Turner; 7 16 Travis Stearns, Auburn; 8 88 Kyle DeSouza, East Providence, RI; 9 66 Mike Fowler, Scarborough; 10 44 Kyle Treadwell, Auburn; 11 78 Quinny Welch, Lancaster, NH; 12 73 Adam Polvinen, Hebron; 13 14 Scott McDaniel, Livermore; 14 3 Vanna Brackett, Buckfield; 15 72 Chris Coolidge; 16 24 Gunnar Rowe, Turner; 17 54 Shane Green, South Paris; 18 22 Scott Farrington, Minot; 19 60 Tim Brackett, Buckfield; 20 71 Gary Chiasson, Peru; 21 5 Dustin Bisson, Greene; 22 6 Tommy Ricker, Poland; 23 63 Donnie Wentworth, Otisfield; 24 03 Scott Moore, Anson. Ripley & Fletcher Ford Outlaw Sportsman (25 laps) 1 77 Bryce Mains, Naples; 2 5 Guy Childs, Sabattus; 3 67 Mike Haynes, Livermore Falls; 4 19 Steve Moon, Sabattus; 5 72 Deanna Bisbee, South Paris; 6 71 Cody Chiasson, Peru; 7 39 Gerry Freve, Buckfield; 8 73 Troy Jordan, Turner; 9 26 Missy Morgan, Lewiston; 10 99 George Haskell, Casco; 11 97 Shannon Judd, Jay; 12 6 Todd Bisbee, South Paris; 13 2 Dale Lawrence. Allen�s Coffee-Flavored Brandy Street Stocks (30 laps) 1 5 Ryan Hewins, Oxford; 2 34 Spencer Morse, Waterford; 3 26 Corey Morgan, Lewiston; 4 04x Zach Bowie, Sabattus; 5 8 Keith Stuart, Naples; 6 81 BJ Chapman, Bridgton; 7 55 Kurt Hewins, Leeds; 8 36 Rick Spaulding, Lewiston; 9 33 Andrew Breton, Sabattus; 10 48 Curtis Rolando, Newport, RI; 11 23 Zach Emerson, Sabattus; 12 84 David Vaughn, Naples; 13 777 Mike St.Germain, Auburn; 14 3 Josh Childs, Oxford; 15 51 Kyle Hewins, Leeds. Banditos (20 laps) 1 2 Shawn Hinkley, Oxford; 2 41 Dustin Salley; 3 87 Derek Cairns; 4 69 Cam Childs; 5 32 Troy Smith; 6 99 Paul Harmon; 7 11 Billy Childs, Sr., 8 13 Richard Kimball; 9 60 Jake Plummer; 10 17 Dan Wade; 11 44 Robert Kahkonen; 12 4 Josh Kinoll; 13 00 Matthew Manar; 14 10 Travis Verrill; 15 9 David Brennon; 16 41x Dale Durgin; 17 23 Jeremy Decosters; 18 51 Ryan Berry; 19 14 Adam O�Neil; 20 49 Rob Lowe; 21 24 Tyler Green. 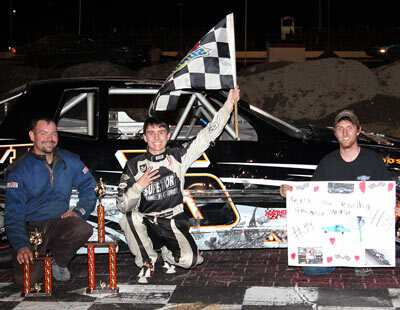 Oxford, Maine � Buckfield�s TJ Brackett scored his third win of the season in the 50-lap Budweiser Pro Late Model feature race, topping the weekly card in the Oxford Championship Series on Goodwin Chevrolet Night at the Route 26 oval track on Friday night. Brackett took the lead away from Conway, New Hampshire racer Mark Lundblad, Jr., who had detonated an engine while leading the main event nearing the halfway point last Saturday night. On the previous Saturday Lundblad led 46 laps before spinning from the lead while battling TJ Brackett for the lead, resulting in track officials sending Brackett to the rear of the restart lineup. TJ took his time until a clear opportunity arose, and once by Lundblad there was not a serious challenge. Veteran Alan Wilson of Hebron claimed runner-up honors, looking consistently strong throughout the 50-lapper. Lundblad scored the third-place hardware, ahead of Dixfield�s Scott Robbins and Jeremy Davis of Tamworth, New Hampshire. Six nights earlier the young Buckfield racer became the first in the top class at OPS to score more than one main event triumph. Returning to action on Friday night, TJ took no prisoners, quickly overcoming his handicapped starting position to challenge early race leader Mark Lundblad, Jr.
After patiently awaiting his opportunity, Brackett got by and the outcome from that point was really not in doubt. Alan Wilson of Hebron capped an impressive run with runner-up finish in front of Lundblad, who made it a point to thank his aunt, best known as Sallie Graves, perhaps the most successful female racer in OPS history. 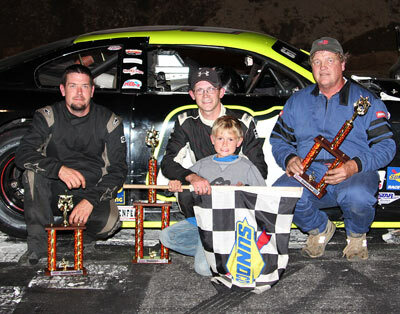 Ryan Hewins reclaimed his position as a championship contender in the 30-lap feature race for Allen�s Coffee-Flavored Brandy Street Stocks, displaying an emotionally-charged reaction to his triumph in the top support class in weekly Oxford Championship Series competition. Hewins took the race lead away from Spencer Morse of Waterford, the racer who lost the lead in the championship standings a week earlier after flipping down the frontstretch on the second lap. While Morse lost the battle, he hung on for runner-up honors and made great progress in the championship chase as chief rival Josh Childs struggled. Corey Morgan prevailed in an entertaining, spirited balle with Sabattus racer Zach Bowie to claim the final podium position nd accompanying third-place trophy. Keith Stuart of Naples raced his vontage Chevelle to a fifth-place finish. Morse and Bowie won heat races. Bryce Mains of Naples wired the field in non-stop action in an unusually-competitive 25-lap feature race for the Ripley & Fletcher Ford Outlaw Sportsman division class. �Wow. We�ve been fighting this all year, and haven�t been able to hook it up,� the winner marveled in victory lane. For the entire distance, Mains had veteran racer Guy Childs nipping at his heels, but never buckled under the pressure. 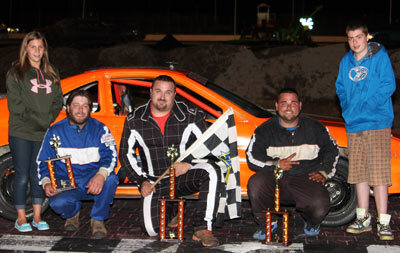 Childs claimed runner-up honors, in front of Livermore Falls racer Mike Haynes. The third-place run by Haynes was particularly impressive, with much of his vast progress from his handicapped starting spot gained in the outside groove. Steve Moon of Auburn was fourth under the checkered flag, followed by South Paris racer Deanna Bisbee, who gained several positions from her starting slot to round out the top-five. Mains and Moon were heat race winners. 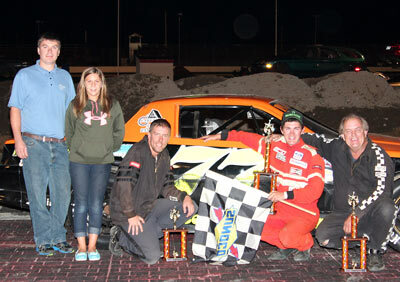 Shawn Hinkley of Oxford returned to victory lane after a one-week hiatus in entry-level Bandit division action. Despite starting well behind the early frontrunners, Hinckley capitalized on timely restarts to outrun Dustin Salley of Norway to the checkered flag. Derek Cairns extended his slim lead in the championship standings with a third-place finish. Cam Cilds and Troy Smith rounded out the top-five in the 20-lapper. Paul Harmon and Richard Kimball posted victories in preliminarily races. Oxford Championship Series competition returns to action on Saturday night (August 23) with the first green flag scheduled to fly at 7:00 p.m. Oxford Plains Speedway is located on Route 26 in Oxford, Maine. For more information please visit oxfordplains.com or call (207) 539-8865.